In recent years there has been regular discussion about the difficulties of writing women’s history and how some female historians have felt compelled to stick to writing about the wives, lovers and mistresses of much more famous men, for lack of sufficient good material on lesser known female subjects. The problem for anyone wanting to write women’s history is, of course, that in a world dominated by men until the 20th century, we are faced with a desperate shortage of primary sources, especially pre 1700. With the best will in the world it is hard to tell the stories of non-aristocratic women in this earlier period. As a result, a glut of Medieval and Tudor women’s history has led to David Starkey’s now notorious complaint that women historians have subjugated the story of the ‘much more important men’, such as his own favourite Henry VIII, to that of his far less significant wives. History, he claims, is being ‘feminised’. Rather than compete in the arena of already well known women – pace Queen Victoria, one of the few about whom there always seem to be new things to say – it has always been my objective to try and uncover new and lost women’s history by searching for intriguing and untold stories from the footnotes. This was my objective with my first trade book in 2007. I had fallen in love with history when learning about the Crimean War at school and had always wanted to write about it. But it is a subject dominated by military histories written by men. I was not interested in the war per se: I wanted to look at the human, behind the scenes story. So I set out to explore the experiences of the many women who had followed the army to Crimea in 1854–6 as wives, nurses, cooks and washerwomen. This involved searching for and reconstructing their stories from very scattered and fragmentary sources. It took a long, speculative and exhausting trawl through around 200 books of letters, diaries and memoirs of the war, in military archives, newspapers and magazines, and on genealogy sites. But in the end I uncovered more than enough lost stories of women in the Crimean War to be able to write No Place for Ladies. Writing that book confirmed my passion for seeking out the forgotten women in history. There is no greater thrill for a historian than finding a story that has been totally lost; to be the first to uncover it and restore it to history. 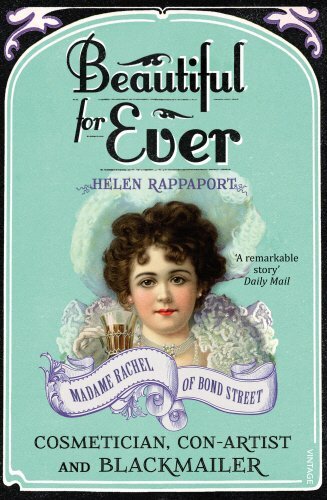 This is what I was delighted to achieve with my 2010 book Beautiful For Ever about the Victorian con artist Madame Rachel of Bond Street. The agent I was with at the time dismissed the idea out of hand when I first mooted it. ‘I’ll never be able to sell that’ he told me. Deflated, I put the idea on the back boiler as a book proposal, but nevertheless carried on researching Madame Rachel in my spare time as a hobby. Before long it became an obsession with me to chase down her lost story. I did so by combining my writing skills as a historian with years of experience in genealogical research. But ultimately it was the contemporary press that brought the story alive for me with the digitisation of so many old Victorian newspapers. This single technical advancement in internet searching has transformed my life and work as a historian and I am sure that of most of my colleagues. Digitisation now makes it possible to uncover women’s history in ways in which it was never possible before, to reclaim the stories of the long forgotten dead. Yes – ‘putting out a hand to the dead’ – that is what all historians do and I hope to continue doing so in my own small way in order to reclaim more lost women’s stories. In the 1900s, a Swedish-born pacifist and women’s and animal rights campaigner, Louise Lind-af-Hageby appeared regularly in the British press for her frequent run-ins with the medical establishment. But who remembers this remarkable woman now? The 1848 Women’s Rights Convention was the first of its kind to openly advocate women’s dress reform. All of the assembled women agreed that the time had come for the simplification of the cumbrous fashions they were obliged to wear. In the late nineteenth century an extraordinary breed of new journalists appeared on the scene in America. The world had seen nothing like them before. They were young, feisty, courageous and iconoclastic – and they were women. “Since our men are hesitating to fight, the women must show them how to die for their country and for liberty…” In May, in Petrograd, Mariya Bochkareva held a mass recruitment rally for the Women’s Death Battalion. Lenin had no qualms whatsoever in ruthlessly exploiting the loyalty of the women who formed his essential back up team. He wore them all ragged in the cause of his own political ends. The story of the extraordinary journey I went on, in search of Mary Seacole – a journey that brought me to her lost portrait that now hangs in London’s National Portrait Gallery. Please fill in this form to receive the latest stories in my Footnotes series — on hidden or little known & previously unpublished stories that I've uncovered during my research. I will also send you regular updates in this newsletter about my work and speaking events.